Orange County Mayor Teresa Jacobs and the Orange County Regional History Center recently hosted a ceremony to commemorate the 50th Anniversary of the Civil Rights Act of 1964. The observance served as a public remembrance of the milestone legislation that greatly expanded civil rights protections, outlawed racial segregation in public places and encouraged desegregation in public schools. 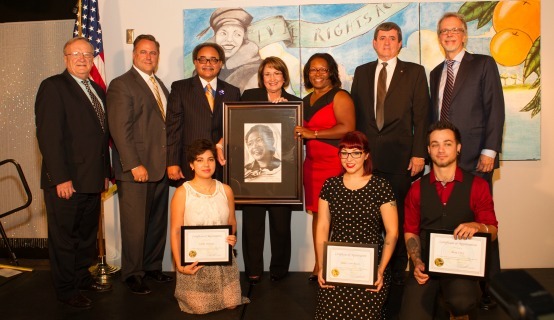 The program included the personal testimonies of several Freedom Fighters including Kran Riley, Orange County NAACP president, who took part in the “March on Washington,” and Curtis Dean, Rosa Park’s Godson, who presented Jacobs with a portrait of Rosa Parks that will be featured at the history center. Dean, who has resided in Orange County since 2000, said he’s proud of how far the County has come since the time of the Civil Rights movement. Additionally, Full Sail University President, Garry Jones, joined Mayor Jacobs and members of the Orange County Civil Rights Committee in unveiling a three-panel mural created by a team of 13 Full Sail art students. Tharp credited local artist and fellow Full Sail faculty member Plinio Pinto for his work creating the mock-up of the piece. The mural features Dr. Martin Luther King, Jr. and Zora Neale Hurston, a writer, folklorist, and anthropologist from Eatonville. Their contributions to racial equality have helped spawn a thriving and diverse community in the heart of Central Florida. A time-lapse video of the mural’s creation can may be viewed at: http://youtu.be/5-Il6o6GhQQ. In June, Mayor Jacobs joined Florida State District 12 Senator Geraldine F. Thompson and Commissioner Tiffany Moore Russell for a celebration to commemorate Juneteenth at the Wells’ Built Museum of African American History and Culture. Juneteenth is the oldest known celebration commemorating the end of slavery in the United States dating back to June 19, 1865. It was on that day that the Union soldiers landed at Galveston, Texas, with news that the war had ended and that the enslaved were now free. A collection of photos from the Juneteenth event and the 50th Anniversary of the Civil Rights Act ceremony are available for use by the media and are located on Flickr.